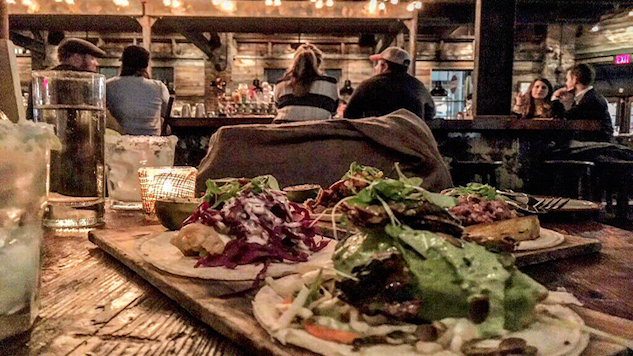 Located in the eclectic South Boston neighborhood, Loco Taqueria & Oyster Bar’s menu is filled with a selection of tacos, ceviche, raw foods, guacamoles and salsas to enjoy. Infusing Latin flavors into each meal, chef Matt Drummond created an eclectic menu of traditional dishes presented in unconventional ways using unique ingredients in each dish. Tacos range from the traditional to beyond featuring such crowd favorites as the Baja fried fish and shaved pork taco to the experiments pairing venison and root beer braised chicken with well spiced toppings and sauces. While oysters have always remained a staple in Boston’s culinary culture, Loco Taqueria & Oyster Bar is reinventing the way they are enjoyed. Adorning them with the fresh flavors of passion fruit, mango, pineapple pomegranate, habanero and citrus, their ceviche perfectly mixes the sweet with the salty taste of the pearl of the sea. Italian food has been a fixture in Boston for generations. From diners to exquisite fine-dining, Italian establishments have become ingrained in the culture and history of this metropolis. Boasting an authentic Roman trattoria experience, Cinquecento in South Boston serves traditional dishes created with local and imported ingredients to give guests a truly one-of-a-kind dining experience. This restaurant is set in a space that infuses Italian design elements to create an upscale and cozy atmosphere. While their regular menu features standard Italian fare, their daily specials feature the finest cuts of meat with high-end sides. With over 100 wines on their mind, their staff offers of a wealth of knowledge to help pair the perfect glass with each dish. Pastoral has quickly become one of the best restaurants on the bustling strip of Congress Street in Fort Point. Creating authentic Neapolitan pizzas with fresh and modern ingredients, Pastoral adds theirs own modern flare to rustic recipes. Using local clams and other seafood, Pastoral has found ways to incorporate the fresh marine flavors that are known to Boston into Italian dishes. With a lunch counter, bar and dining area, this restaurant offers a relaxed and inviting space to enjoy delicious and affordable Italian food while challenging your taste buds. Considered one of the best new restaurants in Boston, Tasting Counter is a small restaurant (only 20 seats) located in the Aeronaut Brewing Company. Under the direction of the renowned chef Peter Ungár, this establishment is the pinnacle of fine dining in Boston as the menu is created nightly to intrigue and probe guests’ culinary curiosity. Each dish has been masterfully created in a detailed and precise manner informing guests of the process upon the arrival of each course. A nine-course dinner begins at 8 p.m. for the lucky handful who are able to purchase tickets online in advance, and includes beverage pairings with each course. Tasting Counter uses mostly locally sourced ingredients and serves only all-natural food and wine. For those venturing over to Cambridge, Parsnip is a stylish and upscale restaurant and bar that offers an exceptional menu of locally sourced and seasonal cuisine. Set in the heart of Harvard Square overlooking Winthrop Park, Parsnip boasts a menu rooted in European traditions full of refined concoctions that highlight the natural and rich flavors in each dish. The diverse restaurants making their way onto Boston’s food scene are helping turn this city into one of the best destinations for foodies to explore. As eclectic chefs find their way to Beantown, instead of ignoring traditional New England seafood, they incorporate the catch of the day into their adventurous menus. From tacos to pizza and everything in between, here are some of best restaurants in Boston that are changing the way locals are dining. Caleigh Alleyne is a travel and lifestyle writer and editor of The Creators Commune. Follow her adventures on Twitter and Instagram.